It’s a tale as old as time (or of the last century at least): the love consumers have for brands. While the addition of social media has added an interesting element to the relationship between people and brands, the concept of brand loyalty is nothing new. My grandmother has always sworn by Olay beauty products and I will always choose Coke over Pepsi when given the choice. What has changed is the brands themselves. Social media has given them the chance to join and add to a conversation that has been happening for decades. Many times this conversation turns from a simple interaction to genuine affection. But what exactly makes people love brands on social media? Across a wide range of industries, there are certain qualities of well-loved brands that stay the same regardless of product or service. I’ve broken down some of the reasons fans fall for brands below. The basic premise of social media is a forum for dialogue. For brands and consumers, it’s no different. Whether communicating a negative experience, funny story, or positive anecdote, consumers expect immediate responses from brands. When fans receive swift and personalized responses, it only strengthens their affection for a brand. 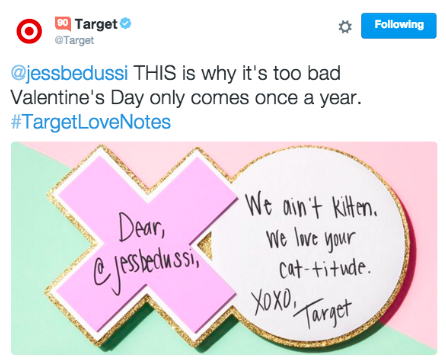 I recently tweeted at Target expressing my love for a recent social media campaign, #TargetLoveNotes. Not long after, I received a personalized Valentine response from Target referencing my love of cats. This attention to detail and swift response goes a long way, converting passive fans to engaged loyalists. This identity content can be both attainable, like Coca-Cola, or aspirational, like Louis Vuitton. What it has in common is the fans who share want to either represent themselves or who they want to be seen as. While the old saying may be that opposites attract, humans also find love through the realization of similar interests. In fact, the American Psychological Association reports relationship satisfaction is related to personality similarity. When a consumer finds him or herself in branded content, similar feelings emerge. Brands like Benefit Cosmetics understand the value of identity content and regularly incorporate such into their content mix. 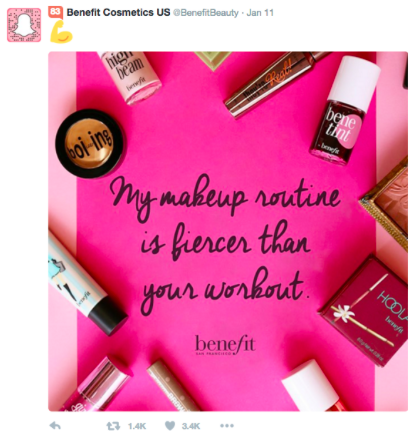 As a Benefit connoisseur, I see myself in their content which in turn leads me to regularly share their posts. Because people value brands as extensions of their own identities, they also seek validation from brands. 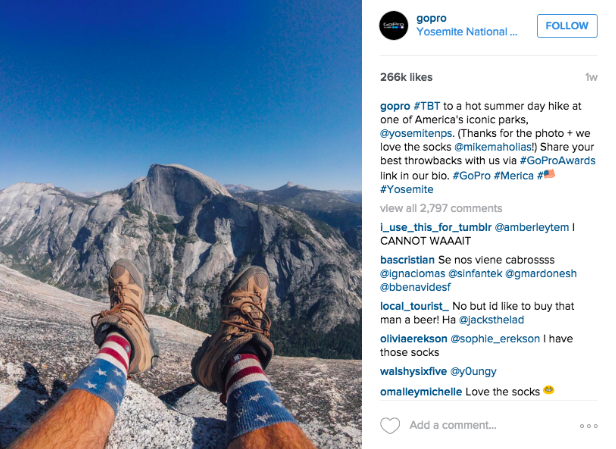 One way brands validate consumers is through the use of user-generated content or UGC. This UGC allows brands to highlight superfans and gives these fans validation from a brand they trust and respect. When a fan reaches out to a consumer, sharing an image or positive anecdote, they look for a brand to engage, praise, and substantiate their identity in the brand. Just like any relationship, fans need reassurance that brands value them and really, truly care. GoPro uses a wide-range of UGC to highlight fans, share their experiences, and confirm their status as adventure seekers. This approach not only encourages more UGC, it also results in a brand image that is respected and loved. While many things go into defining and maintaining, a lovable brand image, consistent everyday actions help build relationships between brands and fans. And just like in any relationship, sometimes the simplest gestures mean the most. Which brands do you think do a great job at fostering relationships with their fans?